Check your local humidity level--Click --enter your zipcode. Everyone's hair reacts slightly different, so, having a bad hairday, check the humidity level to know how your hair changes..
20%--What you would expect in a desert. 30% to 50% is recommended for homes by the EPA to inhibit growth of mold and bacteria. 30% to 60%--relative humidity in a normal "air conditioned" environment, is what the AC and Heating folks say is acceptable. Below 30 percent, some people experience dryness in their nose and throat; over 60 percent, the air begins to feel uncomfortably sticky. Above 75% is high-- definitely Bad Hair day range. Keep the frizzies away!! Make an appointment with Chasity for the best style and cut for you. 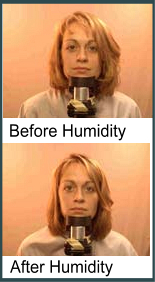 The humidity levels are important to how you look. How you look is important to us. A while ago Fox News had an article, that said, looking at a pretty woman for 15 minutes a day increases a man's life span by 5 minutes. So, ladies I need those 5 minutes, so avoid those Bad Hair Days. Your hair absorbs mositure from the air. This fact has been known forever. The length of your hair can change 2 to 3 percent, depending on the humidity level. If your hair is 10 inches long, this is almost a half of an inch. In 1783 Horace Benedict Saussure use this fact to invent a cool tool — a "hair hygrometer" — for measuring changes in humidity. Want to make your own hair hygrometer? Check out these fun expermints. Here is a slightly different model Make a Hair Hydrometer. We recommend, get to know your Bad Hair Day humidity range. For, those important events, job interview, first date, check the Frizz forecast. The best way to overcome the	effects of humidity is to work with the natural texture of your hair. Rather than fighting to smooth and straighten curly hair, select a style that works with your natural waves. If your hair is straight, don't waste your time setting your locks into curls that will inevitably fall flat in the summer heat. Watch out for Humidity Attack! Water in the air as humidity can also penetrate your hair shaft and loosen up those hydrogen bonds you worked so hard to create! The best way to prevent "humidity attack" is to use hairspray on your finished hairstyle. The hold polymers in hairspray are the most humidity resistant polymers around. That's because hairspray polymers are not soluble in water alone- the water must be mixed with surfactants, like shampoo, to weaken hairspray bonds. Ohio State University researchers completed the first comprehensive study of human hair on the nanometer level. Professor Bharat Bhushan and his colleagues examined hairs under an atomic force microscope (AFM), a tool that let them scratch the surface of hairs and probe inside the hair shaft with a very tiny needle. Among their findings: hair conditioners typically do not evenly cover the entire hair shaft. Under the electron microscope, individual hairs looked like tree trunks, wrapped in layers of cuticle that resembled bark. In healthy hair, the cuticle edges lay flat against the hair shaft, but as hair gets damaged from chemical treatments or wear and tear, the cuticle edges begin to peel away from the shaft. That much was already known. The researchers simulated what happens when damaged hair is exposed to humidity; the hairs plump up, and the cuticles stick out even further, leading to frizz. More frizz meant more friction – a fact confirmed by the AFM as researchers dragged a tiny needle across the surface. Conditioner tends to stick to the cuticle edges, and can make the hair sticky on the nanometer scale. The researchers determined that by poking the hair shaft with the needle, and measuring the force required to pull it away. Armed with this knowledge, Proctor and Gamble (P&G)developed a new formula with additives to make the conditioner coat the hair evenly. In tests, Bhushan found that the new conditioner did coat hair more evenly. Effect of water on wet and dry hair When hair is wet it swells up leaving it very fragile and more susceptible to breaking. In fact, wet hair is actually 33% more fragile than dry hair! While dry hair is strong, it becomes susceptible to the negative affects from high humidity levels. Not only does the hair style get ruined, but it can absorb up to 30% of its weight in water, making it more prone to breakage. It is therefore important that shampoos and conditioners address the needs of hair when both wet and dry. "We've developed a shampoo and conditioner system designed for people with long hair to help control the rate at which moistures moves in and out of the hair to help prevent breakage from styling," says Teca Gillespie, P&G Beauty Scientist. These products work in two parts; wet conditioners protect fragile wet hair, and dry conditioners help promote moisture balance for dry hair. Based on this research P&G launched new products in Aug. 2008. This is the best resource, I have found on the web, for infomation about damaged hair, cause and solutions.